Check-off helps us adapt quickly to our dynamic market. A check-off program is ideal for ready-mixed concrete producers because it gives the ready mixed concrete industry the ability to continuously adapt its flexible framework to ever-changing needs. 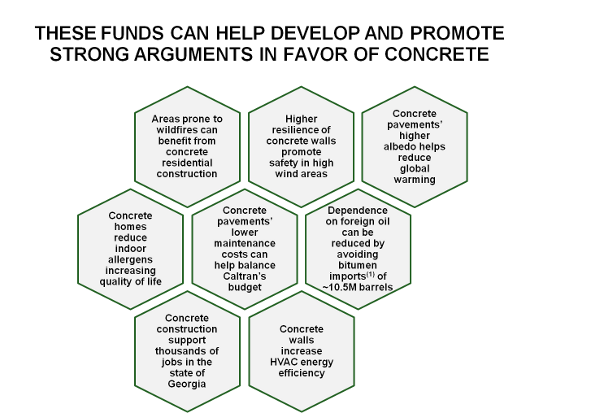 Concrete producers decide how our self-assessed Check-Off funds are collected and invested in promotional, educational and research efforts. Promote – check-off programs are only permitted to conduct promotional efforts on generic products, such as ready-mixed concrete. Producers decide how to shape the message and which audiences – designers, specifiers, purchasers – to target. Teach – this program also permits education of various audiences, ranging from architects and designers to engineers, builders and even building inspectors, who can influence how and where ready-mixed concrete is used. Learn – our Check-Off program enables us to fund research that documents ready-mixed concrete’s proven competitive advantages over other building products, proves the value of its key characteristics and develops new applications that help expand our market share. Repeat – a unique aspect of our program is that it returns a sizable portion of funding back to state, area and local RMC associations for localized marketing and promotional efforts, enabling us to rapidly identify, reward and repeat those efforts that are most productive. Unlike our state and national associations – whose challenges are growing as budgets are shrinking – our Check-Off program focuses exclusively on increasing market demand for ready-mixed concrete. It frees our current associations to channel their efforts more effectively on the political advocacy that check-off programs cannot, by law, perform.